His name may be inexorably linked to that of Prosumer for their collaborative work and one of the most recognizable singles of 2008, but Murat Tepeli has always had his own thing going. 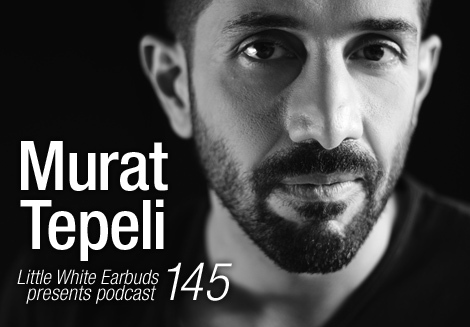 In an industry where many of the denizens eat, sleep and breathe music, Murat Tepeli is somewhat of an anomaly. Though music has been a large part of his life since a very young age, in adulthood, it’s a sideline from his profession as a surgeon. After a childhood spent learning instruments, Tepeli started buying records and DJing in the mid 90’s, and although he started out playing hip hop and drum & bass, he later garnered a deep affection for house music via classic labels like Trax and Relief. Studying medicine from the late 90’s meant that music was always going to take a bit of a back seat, but as his DJ sets and releases can attest to, this has in no way diminished the passion that Tepeli has for his creative outlet. Little White Earbuds got in touch with the Turkish-born Tepeli to find out more about the making of Serenity, whether we’re likely to see further collaborations with Prosumer, and what role music plays in a life that is primarily dedicated to saving lives. He also mixed our 145th exclusive podcast, a deeply felt collection of house and techno that is executed with… surgical precision (sorry). You have more recently been releasing solo records, but you first came to light through your collaborations with Prosumer. When did the two of you first meet and how? Murat Tepeli: It was 1997 when I moved to Saarbrücken where I started to study. I went shopping in the local vinyl stores, especially at Hard Wax Saarbrücken. Achim [Prosumer] was a very good friend of one of the owners so he was also regularly hanging around at the store so it didn’t take long until we both got introduced. How long was it before you started to make music together? I really don’t know when it was exactly. I’ve been DJing since 1994/95 and I guess I started producing my own music around 2002. So it must have been about six years after we met. Had you been making music yourself before this? And did you have any formal training with instruments? I’ve been always attracted to music my whole life. My father gave me a present when I was five or six years old; it was a Saz, a Turkish guitar which I started to learn. It was actually a big one, so I really struggled playing on that. Later I played the trumpet and trombone in the big band of my high school. But I soon realized that it’s not the kind of instruments I like to play, so I told my parents that I would love to have a synthesizer, but all I got was a cheap Casio preset keyboard. But that was fine for the beginning, because I realized that I can play sounds with it which I like. But the real first steps in producing electronic music was when I got my Amiga 500. It must have been when I was 14. Besides playing games I was interested in programming simple games, and I got myself some tracker programs like Protracker or Soundtracker and I started to program beats and music. I was very limited because I didn’t have a sampler, which was too expensive, so I had to find another way to build up my sample collection. One day I found out that there was a program which could rip sounds, or even the whole tracks out of the RAM memory of the computer, if you played a game and just switched off the computer. I tried to program beats from famous dance tracks. I don’t how much time I spent ripping sounds out of games just to find out the right sounds to program a beat, like “Calling Mr Vain” from Culture Beat and I was so happy and proud to listen to the result, which was really close to the original. All my friends laughed about it. I wished I still had those versions. Your Serenity album was the first album released on Ostgut Ton. How long did the album take to come together? I can’t believe that it’s already four years ago now. Time runs so fast. I think from the moment where Michael from Ostgut asked us if we wanted to do an album for the label it went quite fast. Achim and I were already having lots of ideas, since we had already done some tracks together. It just took us a few months to focus the ideas for the album, and the whole production in both of our studios we did within a month. It’s been a few years since the two of you released something. Are there any plans for more Prosumer & Murat Tepeli releases? I can only speak for myself but hell yeah, of course! It’s just too hard to find some time together with him at the moment. He is playing a lot so we rarely see each other. Achim doesn’t have his own studio right now and there hasn’t been the chance for him to find time to come over to Cologne to my studio. But we are getting there since I’ve been talking about my ideas with Achim a lot recently. One thing I can proudly announce is that there is going to be a 12″ release of mine out on AVA by the end of January with an awesome Prosumer remix. So you started DJing in the mid 90’s. Was there a particular moment or particular tracks that you heard that really made you want to start? Yes definitely. My sister brought home all these mixtapes and compilations from a DJ with tracks like Heavy D, Adeva, Soul II Soul, The Wee Papa Girl Rappers, The Cookie Crew, Fast Eddie, Mantronix, Redhead Kingpin. That stuff really blew me away. I was sure one day I was going to do mixtapes like that. Your day job must keep you very busy which I’m sure explains the sporadic nature of your musical output. How long have you been working in medicine for? I got my University degree for medicine at the end of 2004 and I started working in a hospital in 2005. Since then I have worked on my specialist training in orthopedics and trauma surgery, which I completed at the beginning of this year, but I never completely stopped the music. I never would have imagined us to have such a resonance with our releases, but at one point I was just exhausted. Besides working full time in a hospital and having shifts every second weekend, we had lots of gigs the other weekends when I was supposed to have time off, so at one point I had to decide that I have to take care of myself so I decided to reduce the music. But one thing was sure, I knew that as soon as I got my certification I would start doing more music again. Does this mean you have to turn down a lot of requests for remixes and DJ gigs? I had to turn things down. But things changed with this year. I am a freelancer now so I only do substitutions for hospitals. Right now I can afford to spend more time in the studio. I started doing DJ gigs again but I am trying to focus more on my own releases at the moment, so I try to be in my studio as much as possible. It makes me feel miserable when I listen to all the drafts and ideas I did over the last two years, because I never had the time to finish my ideas. There are so many patterns on tapes and on my computer, and it feels like skipping through a graveyard. I don’t want that to happen again so I’m trying to be more disciplined right now. Though I love having DJ gigs, watching Achim being so busy right now and having up to three or four gigs in one weekend, while traveling all over the world, one cannot try to be creative for the rest of the week. It just doesn’t work. So I am aware of that and I try to focus on my own stuff right now rather than playing a lot of DJ gigs. Is there ever any crossover in your careers? For instance have you ever seen one of your patients at one of your gigs? Given that things must be quite full on with your career in medicine, what role do you feel music plays in your life? I sometimes feel like I live in two different worlds, but as I think about it, I should be really, very happy with it. It allows me to find my balance. Working in an emergency room can take you down so bad. People getting injured and having to deal with their handicaps for the rest of their lives or even people dying. It’s not a place where you can let your emotions go. If you do so, you just break down very fast. I remember my first two years in the hospital: it was so hard. I came back home every day with mixed up emotions, totally exhausted. So you try to build up a shield to not let your feelings through. It helps you to get through the day. But it also changes the way you behave in private. One day I was told that I’m not an emotional person, that really hurt me very bad. Everybody is vulnerable, some of them show their emotions very easily, some of them try to hide it. And I thought about where my feelings went and it might sound cheesy but I realized that it was in the music. When I was in the studio or DJing, it was the time and place I could let go. Every time I had a gig I felt a big release. I just love to be on the dance floor and let my emotions go, whether it’s a happy or a sad moment. Meanwhile I can even admit that I don’t have to feel ashamed if I feel like crying next to the dance floor. I appreciate those rare moments and I even start to enjoy them. When I DJ I find it very relaxing nowadays being able to mix dance music from all the decades and I appreciate it so much that people enjoy and celebrate all that great music on the dance floor. And I am so lucky to have so many talented people I got to know over all these years and can even call my friends. Over the past few months I got some really great tracks from them I wanted to share on the podcast, some stuff on AVA — the new label from Cologne I support — plus some old classics you might know or not know yet. And what can we expect from Murat Tepeli over the next year? Watch out for a new release of mine on AVA by the end of January. Its going to be a 12″ with two tracks of mine plus a great remix from Prosumer and one from Damiano von Erckert (the head of AVA). And there is going to be a great 12″ on Philpot, which is also going to be released in the first quarter of 2013. And hopefully lots of great time in the studio together with Prosumer again. A Great Mix – some SICK tracks on this bad boy. Thank you! Genuine words from a guy with truly genuine music. Serenity is still one of my favorite albums ever! A stonking monster of a mix. Just brilliant music from start to finish. Thanks for blessing us with this. absolute beast of a mix, best one i’ve heard for ages. many, many thanks for the mix and the words! indeed, (t)his love is tight (track 04). are you sure that 20. Roger 23, “Optical Tjeck”” is right? i want to buy the track but i can’t find it. This is the tracklist as provided by Murat.